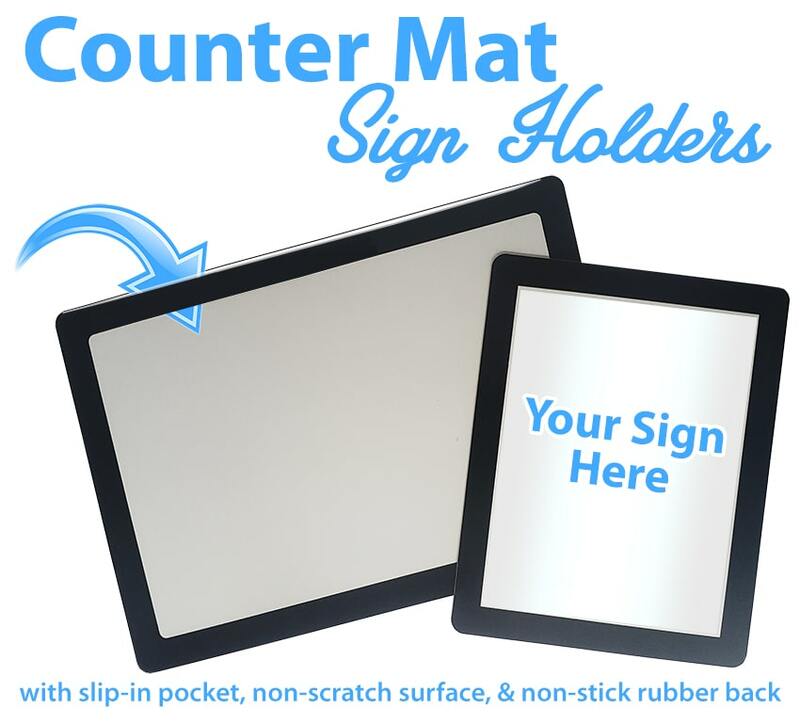 New Product Alert: Counter Mat Sign Holders -- With our new counter mat pockets, you can stop wasting your counter space as a valuable marketing tool. Every customer who reaches your checkout counter will see this media, giving you the opportunity to provide them with any information you choose with a very high view-rate. Whether you choose to use these counter mats to hold a current promotion you are running for a discount or deal, or promote other services and products that need a little push, or whether you choose to give your customers a way to connect with you outside of the store with your social media channels, these slide-in counter mat sign holders are a great choice! These durable counter display pockets are made of a combination of sturdy materials to ensure they can withstand heavy handling, with the understanding that customers will set their purses and change down on them, as well as the fact that they will be changed out and used for a very long time. This is why they are manufactured of a thick 15 mil vinyl front that is scratch-resistant and a thick black rubber backing that is non-slip. They have a black border around the view area that can help bring attention to your promotion, as well as make them look more elegant. The view area is very slightly over-sized for the intended media, which gives you some wiggle room when placing your items, as well as allows for a full-bleed design that won't be cut-off. Insert Size 8 ½" x 11" 11" x 17"
Overall Mat Size 10 ½" x 13" 13" x 19"
A major benefit of these slide-in counter display pockets is that they do not need to be adhered down onto your counter. This makes them completely removable and re-positionable as many times as you need, and means absolutely no mess when removing. 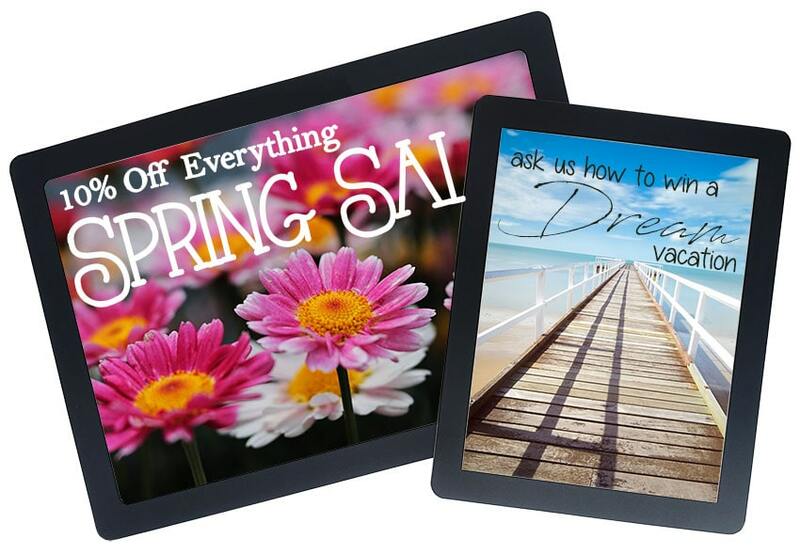 With a laminated counter display or even a self-adhesive sign holder, you are kind of stuck with it. And if/when it needs to be removed, you have to use a specialty adhesive remover to get the glue off your counter. 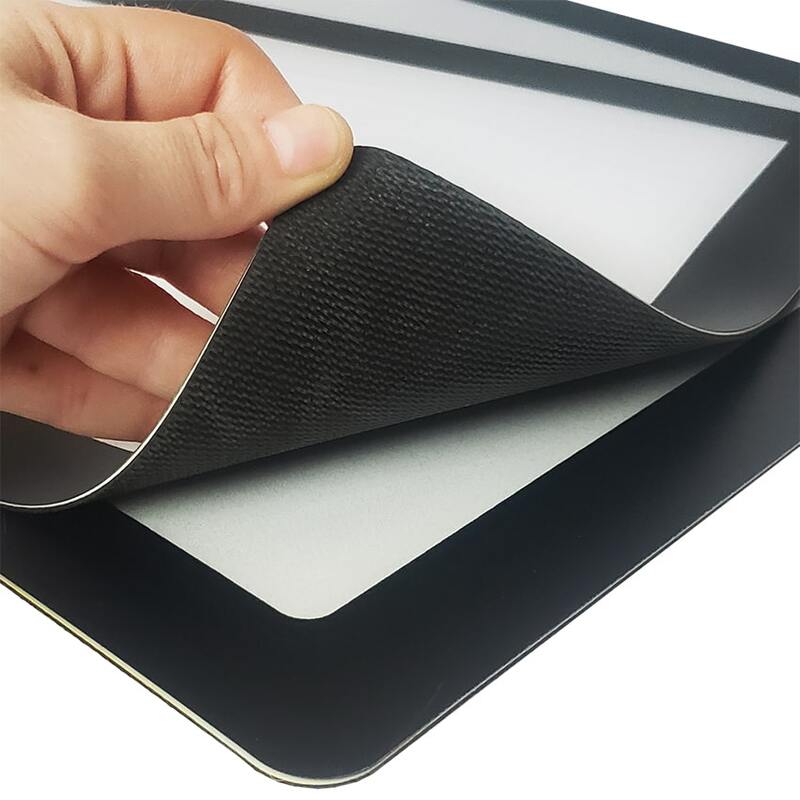 But these counter mats eliminate those problems completely, while still offering a professional and clean way to present your media and POP displays. I hope this information has convinced you of the benefits of used a counter mat sign holder pocket. If these counter mats aren't exactly what you are looking for, we do have a variety of other sign and literature holders to choose from right here.